We’ve heard a lot of talk about Apple’s rumored 12.9-inch ‘iPad Pro’ as well as potential software enhancements for the larger-screened iOS device lineup, and a new report from 9to5Mac covering the future of iPad updates sheds some light on what to expect from Apple’s new tablet hardware and software. Apple is working on a number of upgrades to “reinvigorate” the iPad lineup over the next year. The first of which, is a new dual-app viewing mode. This split-screen multitasking was originally planned to but alongside iOS 8 but was pulled due to its lack of polish. According to the report it was penciled in for iOS 8.1 but attention soon shifted to the iPhone 6, 6 Plus and Apple Watch software with engineers being reassigned. Of course, the software feature could be pulled ahead of next month’s WWDC as it continues to be iPhone Development India ahead of the first iOS 9 betas being seeded to developers. The split-screen feature was reportedly designed with the larger, 12.9-inch iPad Pro in mind so could potentially be held back to arrive with that product, although it does not yet have a release timeframe locked down. The 9to5Mac report corroborates a lot of previous information we’ve heard about the larger tablet which will essentially be a blown up version of the current iPad Air 2. Codenamed ‘J98′ and ‘J99′ — for the WiFI only and WiFi + Cellular versions — the iPad Pro’s main difference apart from physical size will be the additional speaker holes. Apple plans to further tweak iOS for the larger displays beyond split-screen apps. The company is also testing core app and feature redesigns, including ones for Siri and Notification Center, in order to make better use of the screen real estate. We’ve also heard the larger iPad will have additional keyboard and USB support. Lastly, the report points to a significant new iOS feature: support for multiple users. This feature would allow multiple users to share an iPad and have access to only their own media and apps when logged in (similar to how it works on the Mac). 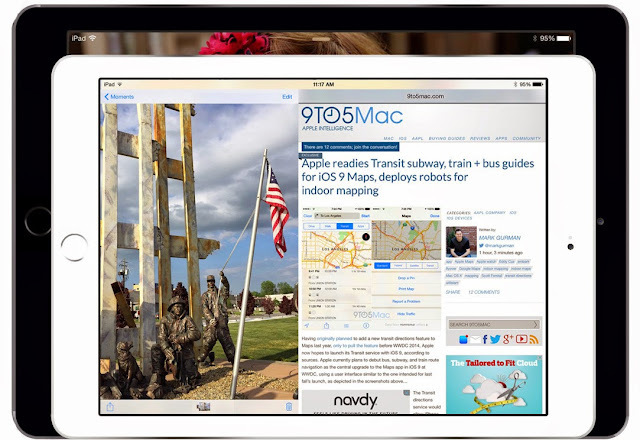 “As of earlier this year, Apple had planned to ship multiple user support in iOS 9,” states Mark Gurman of 9to5Mac. “Sources now indicate that the feature has been pushed back from its planned WWDC Keynote debut and is unlikely to be ready for iOS 9.0 this fall”. The feature could re-emerge as a .1 or .2 release, perhaps alongside the iPad Pro hardware, or be pushed to next year.